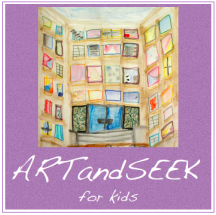 Our aim is to bring adults and children closer to art appreciation in fun and interactive ways. Art is not only about art: children and adults can develop critical thinking, language skills, interpersonal communication and have fun at the same time, just by learning to LOOK and TALK about what they SEE in a museum. By addressing themes and questions that arise in relation to modern and contemporary art, children can build up on their knowledge and life experience. Language matters! In our globalised world, English is fast becoming a tool for communicating but also a way of living. Our activities combine the power of images with discussions in English, so that children and young adults have the opportunity to absorb the language effectively, unselfconsciously and playfully. We are also committed to the learning process by offering a select number of bi-lingual English and Italian programmes. It is never too early or too late to learn how to look at art and artists- but it helps if we understand at an early stage that there are more ways to describe the world than just words and numbers.This is why we offer programmes for young children (pre-school), as well as students of all ages looking at art through a thematic lens. Skills matter! The latest thinking about education and future success encourages a shift away from traditional knowledge towards developing critical skills for life. How much we know matters less than how we learn and we gently guide students towards learning how to think outside of the box. We create interactive group experiences for children, young adults and families, using Rome’s museums as our playground. Our trained instructors guide the audience to learn not only how to look at art and artists but also how to interpret themes that impact their own lives such as identity, architectural surroundings, history, friendship, social issues, through ‘investigating’ art as a window to the world. We design journeys for the imagination. Our programmes are not only about taking a tour through a museum, they are mainly about communicating our thoughts using art as a tool, to express what is sometimes difficult to describe. We also focus on practical art workshops inspired by the themes we explore with each programme, helping students to experience different art activities and build confidence and awareness of their individual strengths and competencies. Museum programmes consist of a 1.5hr visit to any one of Rome's modern and contemporary art museums. The activity is built around a theme and examines 4 to 5 artworks at a time. During the visit the audience is engaged on two levels: participating in hands-on activities, using different art tools and skills, and being part of a lively discussion facilitated by inquiry open-ended questions. Our school programmes are generally conceived in 3 or 5 sessions. All of them can be adapted, in length and theme, to support specific curriculum areas. During each session the students observe and analyse several pieces of art, reflecting on the artistic process, examining "big questions". They are then engaged in art activities, investigating the properties and possibilities of materials through interdisciplinary learning. We believe that a thematic approach supports student-centered, interdisciplinary teaching.